Until the mid-Eighteenth Dynasty women wore a tight-fitting sheath dress, a simple garment that falls from just below the breasts to just above the ankles, being held up by two shoulder straps. On statues the straps cover the breasts, but in painting and relief the single breast depicted in profile is exposed. The dress hugs the body with no slack. Also when women are shown in movement, sitting or kneeling, the dress still clings to the outline of the body as if elasticated. 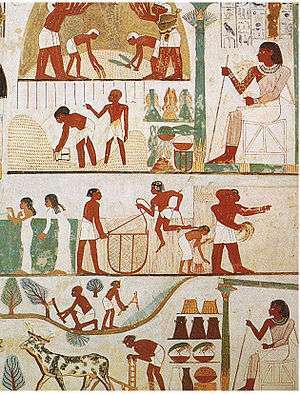 However Egyptian clothes were mostly made from linen, which tends to sag. Surviving dresses consist of a body made from a tube of material sewn up one side, supported not by straps but by a bodice with sleeves. In contrast to dresses shown in art, such linen garments tend to be baggy, and would conceal rather than reveal the body. Children wore no clothing until 6 years old. Once they turned six years old they were allowed to wear clothing to protect them from the dry heat. A popular hairstyle among the children was the side-lock on the right side of the head. Even though children usually wore no clothing, they wore jewelry such as anklets, bracelets, collars, and hair accessories. When they grew up, they wore the same styles as their parents. Wigs, common to both genders, were worn by wealthy people of society. Made from real human and horse hair, they had ornaments incorporated into them. They were often woven into certain hairstyles and were quite inexpensive. In the royal court, women sometimes wore cuplets filled with perfume. They were worn to also keep out head lice and protected the head when doing dangerous things. Jewelry was very popular in Ancient Egypt, no matter the social class. It was heavy and rather voluminous. The main reason for wearing jewelry is because of its aesthetic function. The Egyptians were quite soberly dressed in white linen fabrics, and jewelry offered a possibility for contrast. The Egyptian preference was towards the use of bright colors, lustrous stones and precious metals. Gold was won in large quantities in the eastern desert of Egypt, but also came from Nubia, that was an Egyptian colony for centuries. On the other hand, silver was rare and was imported from Asia. Therefore, it was silver that was often considered more precious than gold. The eastern desert was also an important source for colorful semi-precious stones such as carnelian, amethyst and jasper. In the Sinai were turquoise mines, the deep blue lapis lazuli had to come from far away Afghanistan. Glass and faience (glaze over a core of stone or sand) were favorites to replace rocks because they could be produced in many colors. The Egyptians became very skilled when making jewelry from turquoise, metals like gold and silver, and small beads. Both men and women adorned themselves with earrings, bracelets, rings, necklaces and neck collars that were brightly colored. Those who could not afford jewelry made from gold or other stones would make their jewelry from colored pottery beads. 1 2 Ancient Egypt Fashion. 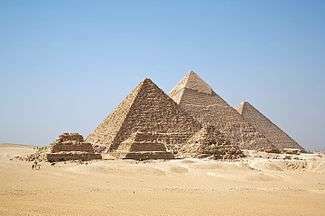 Ancient-egypt-online.com. Retrieved on 2012-05-05. 1 2 3 The Latest Fashions in Ancient Egypt. Touregypt.net (2011-06-13). Retrieved on 2012-05-05. ↑ Tierney, Tom (1999). Ancient Egyptian fashions. Mineola, N.Y.: Dover. p. 2. ISBN 9780486408064. 1 2 Ancient Egypt: Clothing. Reshafim.org.il. Retrieved on 2012-05-05. 1 2 3 Springer, I. (December, 2010) Egypt: Tour Egypt Monthly: A Kid in Ancient Egypt. Touregypt.net. Retrieved on 2012-05-05. ↑ – Ancient Egyptian Jewelry. Dr. Maarten van Raven, Curator Archaeological Museum, Leiden, the Netherlands 2016-01-02. Retrieved on 2016-03-17. ↑ Clothing – Ancient Egypt. Historyonthenet.com (2010-04-30). Retrieved on 2012-05-05. ↑ Cleopatra's Eye Makeup Warded Off Infections?. News.nationalgeographic.com. Retrieved on 2012-05-05.